Urban combat in the city of dreams. Olympus is a utopia existing in the middle of the wastelands left after World War 3. The city is run by genetically engineered humans called Bioroids. While some are content to live in the city, other feel its a prison where they aren't free to exist as they choose. Terrorists conspire to bring down the city, but two cops Deunan and Briareos will have to stop them. While duty compels them to do their job, the battle may not just be one of bullets, but ideals as well. 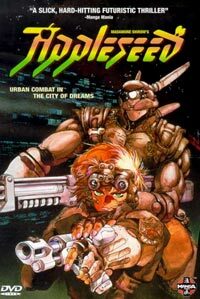 Appleseed is a one off OVA poorly adapted from a fairly complex manga of the same name. 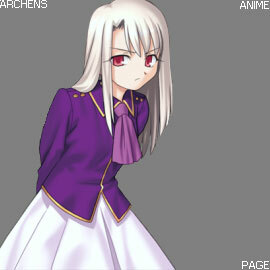 While dated, the higher production quality of the design and animation still shows through. Like many titles of this vintage, Appleseed was mainly forgotten due to it's lack of compelling story, and failure to pull off anything new. That might seem odd considering the futuristic cyberpunk setup, which should be at least somewhat cool by default. 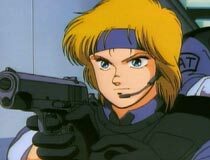 Yet Appleseed fails to do much of anything with its environment. That might be forgivable if the plot was worth anything, but it's so linear and boring that it fails there as well. The third big failing has to do with the core philosophy behind the conflict. Maybe people don't care about this, but it's a big sticking point for me. Olympus is supposed to be a utopia, but some people feel trapped by it. Like it's a prison suffocating them. By having everything provided for them, and not having to worry about anything, it's like torture. Wait, what? Ok, so there's no conflict, or hardship and people are going crazy over that? What is the alternative? People WANT to suffer? 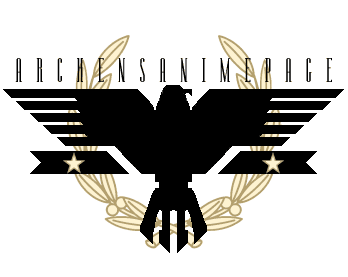 And if people want that, the wastes of WWIII are right outside the city. The concept that people require meaning in their lives to inspire them to live isn't a bad idea, but the way Appleseed tries to play it out here is really stupid. I just can't believe that 1) people can't find ways to occupy themselves in a utopia, and 2) go tossing themselves of buildings when bored with life on a regular basis. 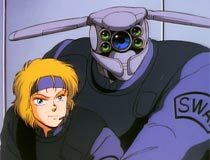 So in the end Appleseed is a clunker. It has some decent action in parts, but makes a poor showing in all other areas. The dub is a Manga Corps adaptation which further strays from the original script by adding random profanity to make it more "extreme". The acting in the dub is also poor so I'd just avoid it. Not worth it considering other titles you could be watching. Calon: We no longer live, we just exist. Living means fighting. Struggling for existence. It's a fundamental part of the human condition. You deny it, you deny life itself.